Yesterday my family and I went to breakfast at IHOP, something we hadn't done in a long time. 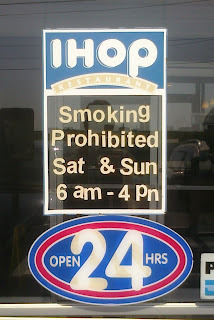 On the front door of this IHOP, there was a sign (below) indicating that smoking was prohibited and then underneath had days and times, the latter of which I took to be their weekend hours of operation (although why would they close at 4:00 PM?). I had assumed that the two bits of information--the smoking prohibition and the day/times--were not connected, but for some unknown reason had been strung together in an effort to save on sign space. When we got inside, we were seated in a section that smelled heavily of cigarette smoke, although there was no one smoking inside. When I asked about this, the waiter told me that we were in the smoking section, but that on Saturday and Sundays between 6:00 AM and 4:00 PM there was no smoking allowed. We quickly asked to be seated in the restaurant's other section. I ask you, what friggin' sense does this make? What kind of genius assumes that the nasty and unappetizing smell of cigarettes--repulsive, at least, for those of us who don't smoke--suddenly disappears from a room? Probably the same kind of genius who thinks he/she can correctly abbreviate "pm." What I find amazing is that you didn't even seem to notice the "pn" rather than "pm" on the sign. What is that, post-nuptial, maybe? The time of day when you're supposed to have wedding receptions or something?